If they were to vote on Kamares most friendly couple, Stavros and Sarah Kaloyeros would win. He's from Sifnos and she's British. Together they will make your stay one you will never forget. The Hotel Stavros is right on the Kamares waterfront with balconies that give a view of the entire bay. Downstairs is a cafe that serves breakfast in the morning, sandwiches and Ice-cream all day, and ouzo and beer anytime. There is an un-official information center in the hotel lobby where Stavros will tell you when the ferries arrive and depart, how to make connections to other islands and even book a room for when you get there. He also rents cars and jeeps, the best way to see the island. The port of Kamares is impressively positioned between two mountain ranges. Here you find local potters workshops, pretty waterside restaurants and a friendly relaxing atmosphere. From your balcony you can watch the sunset on the beach and the ships sail in and out of the harbor. The Hotel Stavros is situated in the village of Kamares and was one of the first hotels in Sifnos. It was built by Stavros' Father and has been in the family for more than 45 years. Each room contains a private bathroom, sea view balcony, refrigerator, air-conditioning, tea/coffee making facilities, TV, safe and hair dryer. The Hotel Stavros is positioned 10 metres from the beach and has stunning views over the bay of Kamares and the surrounding mountains. The Hotel Stavros offers a number of different room combinations including a two bed roomed family flat with fully equipped kitchen which can accommodate up to 7 people. 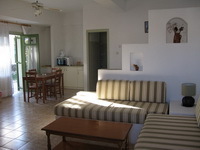 There are also inter-connecting rooms and family rooms accommodating up to 5 people. 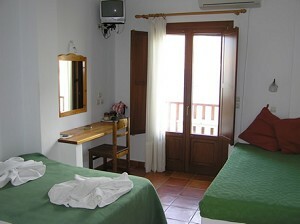 The Hotel Kamari is a small hotel in the port of Kamares just 200 metres from the Hotel Stavros. The spacious newly renovated rooms contain a sea or mountain view balcony, bathroom, refrigerator, TV, safe, air-conditioning, tea/coffee making facilities, telephone and hair dryer. Some of the rooms contain a fully equipped kitchenette. For larger groups or families the Hotel Kamari has two bed roomed apartments with fully equipped kitchenettes accommodating up to 8 people. The sandy beach of Kamares is 5 minutes walk away and the sheltered bay makes swimming ideal. There is an excellent choice of tavernas and cafes around the sea front. If you want to include Sifnos on your Greek Island holiday try using Aegean Thesaurus' Create-an-itinerary form which will enable you to choose the islands and the number of days on each, category of hotel, tours, transfers and other details. The agency will come back with a price and you are under no obligation to buy.